Baby G wanted a mini party at his school & even requested for the Pixar Cars birthday cake. The irony is that he has never watched the cartoon and neither have we bought the toys for him, he only asked for it is because last year, one of his classmates had this cake and he has remembered it til now. tsk tsk tsk. As I only could take the afternoon off, I requested that the party be held during the afternoon snack time. The teachers told me it'll be a bit rushed because they were planning to give extra lessons as Friday was a holiday. Anyway, they agreed and requested that we go earlier. Baby G was pretty excited on that day, he woke up without much fuss and did everything super efficiently. If only everyday was party day, mornings would be such a breeze. We arrived at school at 320pm bringing the cake & party favours. His friends were also excited to see us. 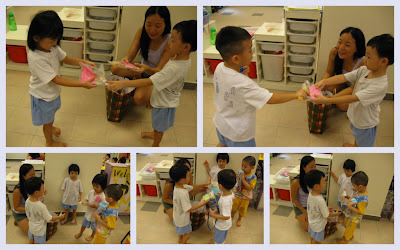 One of his friend, Eugene kept calling me "Gabriel Mummy, Gabriel Mummy, got presents?". I felt a bit like Santa Claus. The only one who didn't really seem excited was Baby G himself and that's because he just woke up from his nap and still feeling a bit groggy. hahaha. The teachers arranged the children into their groupings (A & B) and the singing started. I was quite impressed with Mdm Mou as she immediately offered to cut the cake & even knew how much cake to cut. Everyone had a slice, including me & Daddy. She even knew which child couldn't eat much & cut a smaller piece for her. After the cakes, the children were supposed to drink up their water before they were allowed to get their party favours from Baby G. Everyone was very determined to finish up their water and even showed it to me as proof. 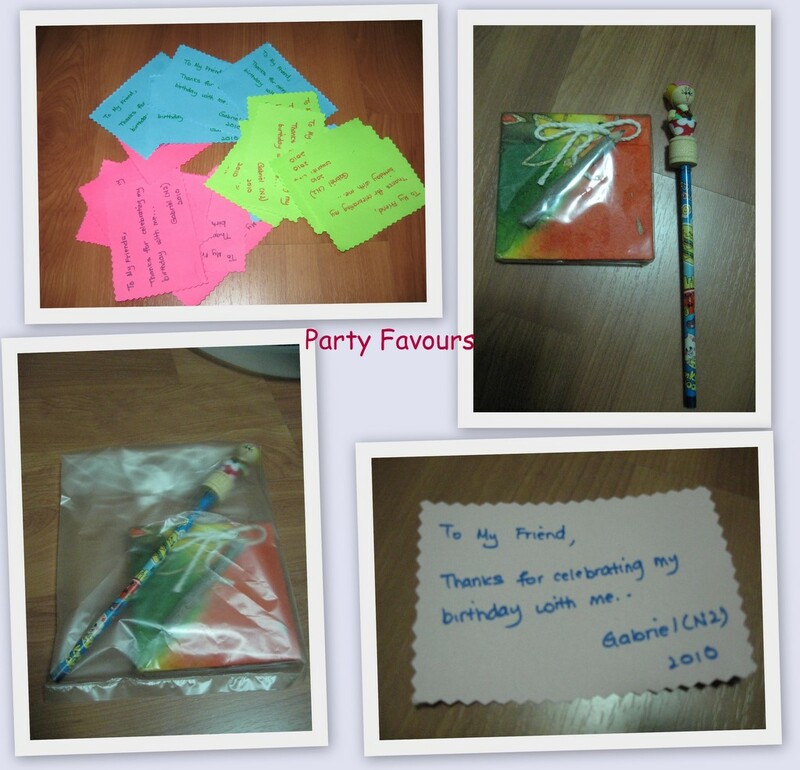 So I asked Baby G to distribute the "party bag". I always try not to have sweets or tidbits in my party bag as I never did like the idea of just giving things to eat. So this year, Daddy came up with a cool idea. Since we were going to Chiang Mai, we decided to get pencils & notebooks from there. Not sure if the children will like it, but it's something different and hopefully, the little ones will find it unique. To make it a little more personal, I added a note there saying "To My Friend, Thanks for celebrating my birthday with me, Gabriel". Hopefully, the parents can appreciate this... hee hee. ==> My boy's 4 already. Couldn't resist adding this photo of Eugene cause he's always been so friendly with me.